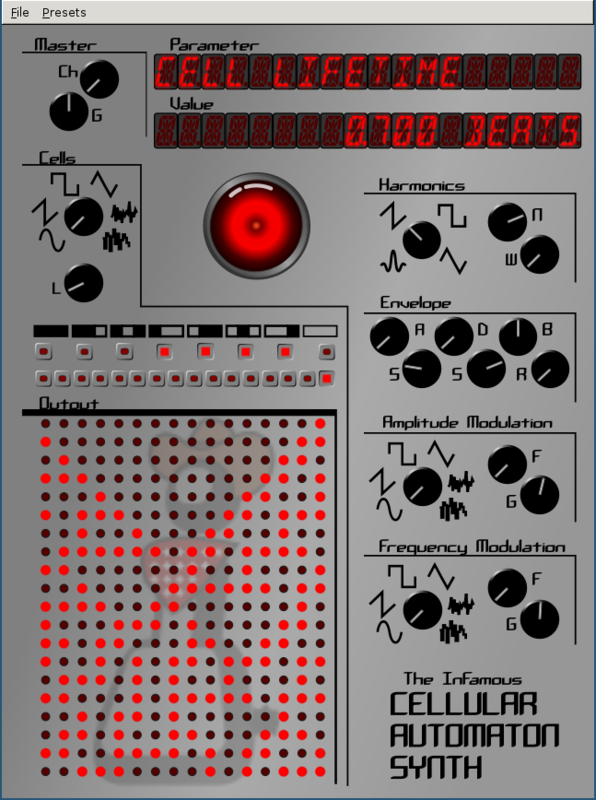 The synth shown above is the current version of the Infamous Cellular Automaton Synth, an additive LV2-format softsynth with unlimited polyphony, created and maintained by Spencer Jackson. The Cellular Automaton Synth (CAsynth) has a variety of interesting sound-sculpting features. To start with, it utilizes "Elementary Cellular Automaton" to produce its initial sound. The soundwaves produced vary according to the cells and neighboring cells that are created, as well as their survival rates and point at which they die off. The initial waveshape is selectable: sine, saw, square, triangle, noise, random. The "L" knob controls how fast the cell pattern in the grid will be scanned. Below it are the 8 "initial condition" selectors (these can be modified), and below these are the 16 "harmonics" selectors. (For a read on elementary cellular automaton, see the Wiki page here: Elementary Cellular Automaton at Wikipedia). The timbre of the sound will depend on the "Initial condition" and "Harmonics" settings. There are 8 initial conditions available. A good way to start is by selecting just one of these. The first one will activate all the cells, thereby giving a richer sound. Selecting the last condition will activate just the odd-numbered cells. The "Cell Automaton Rule" can be controlled (in the native GUI there is a grid for this) by using a terminal at the utils directory and typing ./rule [rule number] [initial condition] in order to more precisely control the sound shape. There is a harmonics knob to add up to 16 harmonics, and a harmonics width knob to allow modulation of up to 50 cents plus or minus the initial pitch. The large red "HAL 9000" button will randomize the settings. There are also channel and overall gain (volume) knobs at the top of the GUI. CAsynth has two LFOs, one that utilizes amplitude modulation and one that utilizes frequency modulation. It has a non-traditional ADBSSR amplitude envelope for unique loudness control: attack, decay, breakpoint, swell, sustain, release. CAsynth can be run in any LV2 host, such as Qtractor or Carla, or in Jalv. A few first presets of my own: CAsynthPresets01 This tarball is to be unzipped in your home directory's ".lv2" folder. -Remember not to overwrite your own presets!